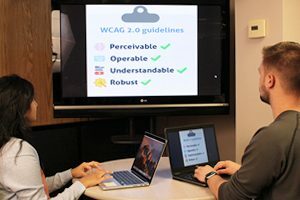 Accessibility is the practice of designing and developing websites, software, and digital media in a way that ensures they are operable and understandable by persons with disabilities and compatible with assistive technologies. The University of Missouri is committed to providing equitable access for students, faculty, staff, alumni and guests with disabilities. Learn more about MU’s Digital Accessibility Policy.